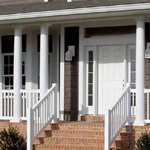 All our vinyl railings meet the Boca 1999 and IBC 2000 building code requirements for safety and strength. Top and bottom rails are reinforced with aluminum channels for added strength. Choose from single post and railing styles or mix and match, even add round columns and curved railing to achieve the desired effect. Easily installed in new and remodeled homes, all railing parts are pre-cut to exact sizes and routed with holes that are consistent and sized with close tolerances for the perfect fit. 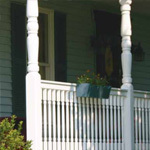 Pair our porch railings with a matching vinyl privacy fences or one of our other specialty products! Our vinyl railings go perfectly with vinyl pergolas, and arbors. If you live in the Lebanon, Lancaster, or Reading area, we are happy to extend our installation services to you. 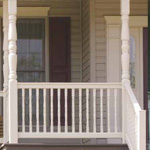 Relive the finest of the colonial styles with our new heritage porch railing. Enjoy this relaxed mature styling from earlier times. The graceful curves of these spindles will give your porch an elegant appearance to cordially greet any visitor. Beauty and simplicity meet to form the charm of the days gone by when chats over the rail warmed the heart of community folks. It feels like home. The soft curves of this gently detailed spindle will make your front porch feel just like the old home place.